I am close to being finished with the android application for piACC. At this point, everything works. 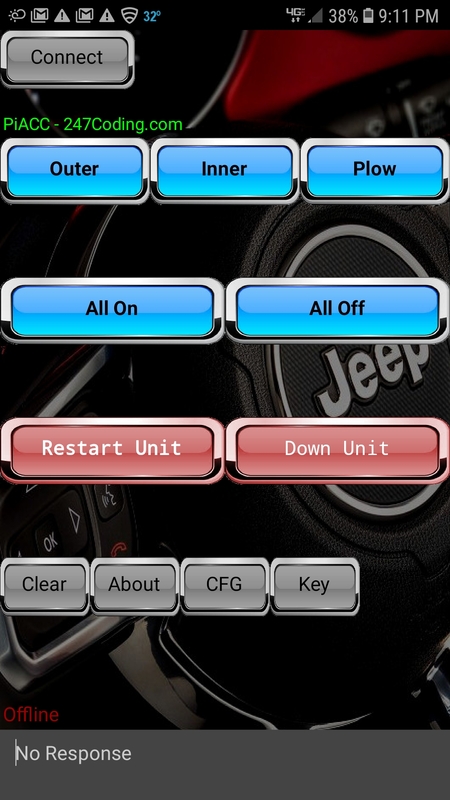 I can connect to the relay controller with both the dashboard controller and my cell phone. Both units are using bluetooth to talk to the under the hood controller. It took a little work, but I have also updated both the piaccbt source and the SPP sourceto toggle the relay based on the current state. Unfortunately, I could not use the same python scripts for both the console and the android. For some strange reason the android would not connect until I used the SPP method. I can possibly get the console to work with SPP but not at this time. I will also be adding button toggles to display on/off in the near future. Currently, they just toggle the light without any notification of relay state. The android app does however announce a message of the state change. The only thing left to do is possibly update the images in the application and probably the buttons. I started on some of it this week but grew so tired from coding all week that doing graphics was just not in the cards. Though it may not look great, it is fully functional. The nice thing about the cell app is that it also feeds the temp of the unit to the application and will alert if the unit gets above the pi internal temperature threshold. The android app is basically instantaneous on button click to relay activation. The console is a little bit slower since it disconnects after each button push and has to reconnect again. This was intentional though. It is also pushing bluetooth via a web page so inherently it is slightly slower. As mentioned i will update the graphics and definitely the icon which is now the OE logo. I am also going to add a "last connection" entry to the database. The next time you open the app it will connect directly to the device you last used if available. The SPP is using a pass key to connect while the console blocks access via mac address. I will probably switch the console to use a key, it is a better option because it can be changed with little effort as well as it also limits mac spoofing. I need to work on the landscape mode of the app. While the buttons arrange nicely on the portrait screen, when switching to landscape the become elongated. I should be able to overcome this though. Since it looks like we are getting some snow now I may be able to test it out with both the plow light and the overhead lamps. They will definitely come in handy at my own house which is very dark at night while plowing. I am thinking of using the fourth and final relay for a rear facing lamp, either mounted to the light bar or under the bumper of the jeep in the rear. I am getting close to having everything completed and should be pretty close if not completed by the end of the year.